(Phys.org)—Sociologists Richard Dukes and Heather Albanesi of the University of Colorado claim in a paper they've had published in The Social Science Journal that when teachers use a red pen to add comments to student papers, students perceive them more negatively than if they use another color pen. Red pens have traditionally been used by teachers when grading papers – ostensibly to make their comments and markings stand out from the original work – but this new research suggests that the use of a red pen may convey unintentional negative emotions. To find out if markings in red had any measureable impact on students, the two researchers enlisted the assistance of 199 undergraduate students – each was given four versions of an already graded essay by an unknown instructor. The graded remarks were deemed as high or low in quality with some written in red, others in blue. The students were asked to read the essay and the remarks given by the instructor and then to rate how they felt about what the instructor had written and to suggest what grade they would have given the essay. They were also asked how they felt about the instructor that had written the original remarks. After they'd finished with their opinions, each was also given a questionnaire designed to provide the researchers with more concrete data. In analyzing their results, the researchers found that the student volunteers didn't seem to be impacted one way or another by pen color when they agreed with the instructor's comments and grade. But when they disagreed, there were definitely some differences – mainly negative. When the instructors' comments were written in red versus blue the volunteers judged them more harshly and as a result, rated them lower in "bedside manner." Overall, they say, the volunteers didn't seem to judge the quality of the comments any differently – their negative feelings were aimed at the person that had written the remarks when they wrote in red ink. Dukes and Heather theorize that red ink is akin to using all caps when writing e-mail or text messages – it's like shouting at a person and those on the other end quite naturally feel a little bit abused and respond by growing angry or sad, which, they note, doesn't really promote the learning process. They suggest instructors stop using red pens and go with a shade of blue instead. Undergraduates read one of the four vignettes depicting a student essay on social stratification, comments by the instructor, and a grade. In a 2 × 2 factorial design we manipulate independent variables of quality of the essay and color of the grading pen. We test hypotheses that a higher quality essay and an aqua grading pen results in higher teaching evaluations. MANOVA show no statistically significant differences on two instrumental evaluation items: instructor is knowledgeable and organized. 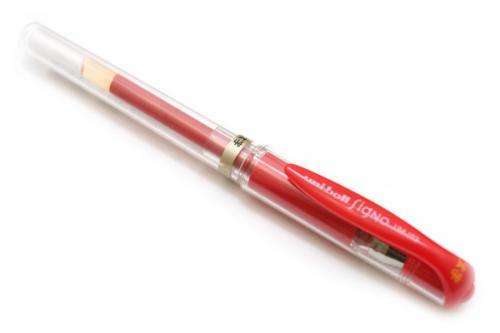 Statistically significant differences are observed for quality of the essay and color of the grading pen on three expressive items of instructor is nice, enthusiastic, and has rapport with students. Results suggest that instructors should use a grading pen of a neutral color. When the first choice isn't available, why don't consumers choose the obvious second choice? This would seem obvious. When grading essays as a tutor I use a green or purple pen. Both are considered friendly colors and sometimes bring a smile from the students I tutor. Blue is too conventional to stand out and does not give emphasis to the grading process. Students will ignore marks or suggestions in blue more often because it is a color they themselves use. Suggestions need to stand out for them to be followed. The other part of written comments that needs to be of concern is legibility. As a student in grad school it was frequently difficult to decipher comments. I suspect readability is closely related to how many papers on which the teacher needs to comment. Larger classrooms means rushed comments and less legibility. In that case, it does not matter what is written or what color pen is used. They can't be read anyway, so the student will not correct the problem in future papers. otoh, red is a violent color... and also the color of fresh blood.